The biggest adjustment for this new iPad user after years of desktop/laptop computing is the lack of physical keyboard. Touch screens may be a plus while consuming information: viewing a Web page, watching videos, reading emails and so on. But when it's time to enter info, an on-screen keyboard can be frustrating and slow -- especially for those of us who have become proficient with a physical keyboard. I plan to buy a wireless keyboard for my iPad so I can use it to write more than a paragraph or two without longing for my laptop. But meanwhile, I'm dabbling with another way to enter info without use of the on-screen keyboard: speech. It was a pleasant surprise to find three voice-recognition apps that both work well and are free. I don't expect these to replace the need to type. But they can make using my iPad more fun. And for me, the tablet experience is all about an enjoyable UI. Otherwise, I could be sitting at my desk. Note: All three of these apps require an Internet connection, since the speech-to-text processing happens on remote servers, not the mobile device. The same basic technology costing $100 or more for desktop software is available for free on iOS (and $4.99 for Android). Not surprisingly, capabilities aren't the same: Dragon Dictation for iOS works only within the app itself, so you can't use it to speak non-app-related commands to your device, such as "launch browser." Instead, this is an app for creating text notes, with in-app options to use them for social media or email. 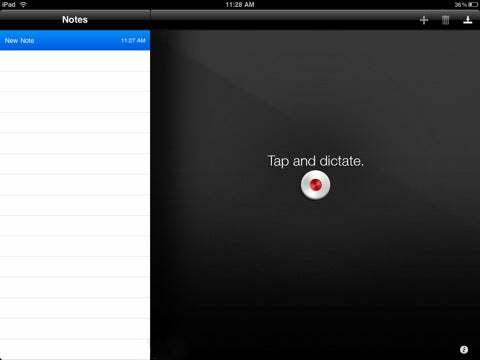 To use Dragon Dictation, you start a new note, tap the screen and begin speaking. You can set the system either to recognize when you've stopped speaking or to accept a tap to indicate when you've finished. I found the manual option better, since sometimes I pause while talking and don't want recording to end. Once you finish, you wait for Dragon to process the text and then results appear on screen. Each word is highlighted individually for possible correction or deletion, and you can also call up the on-screen keyboard for quick changes and additions. You can speak punctuation marks as well as words, although this can get tricky, such as when the system needs to decide if "period" means the word ("a period of time") or the dot. Within the app you can tap to send your processed text to Facebook and Twitter as well as an email, and there are also easy-to-use cut and copy icons. Of course the system isn't perfect, but after a few uses I got decent results most of the time. Nevertheless, having to scan multiple paragraphs and correct errors that I never would have made while typing got frustrating at times, making the idea of the wireless keyboard seem more appealing for longer text. Still, sometimes it's nice to speak an email of a few paragraphs instead of hunting and pecking on screen. If you'd like to check out an alternative to typing into an iPad or iPhone, this is worth a try. I know several power users who never bothered to download the Google app for their mobile devices; after all, search is tightly integrated into the mobile Safari browser. But there's one big advantage of the app over Safari: speech recognition. With the app, in addition to the traditional search bar for typing in a query, there's a microphone icon to the right where you can tap to activate speech-to-text. This app does a great job in figuring out what I want to say. 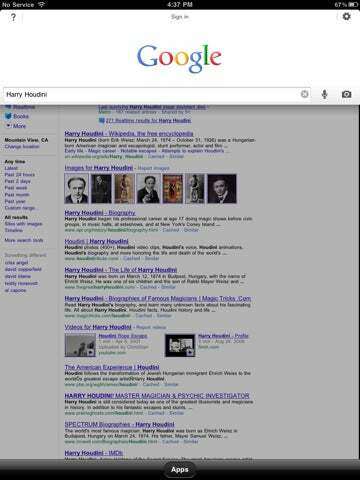 And when it misses, the resulting search term has an arrow for viewing a dropdown list of alternatives. There's also an option for doing a search based on snapping a photo, which I haven't yet tried. My only UI nit is that the back button for returning to the list of Google search results after viewing one of the results links is on the bottom of the screen, not at the top, where most of us who've been using the Web for awhile would expect it. But that's a small point. If you use Google for search on an iPad or iPhone and are at all interested in speech-to-text, I highly recommend downloading the app. As the name implies, this app translates from one language to another. 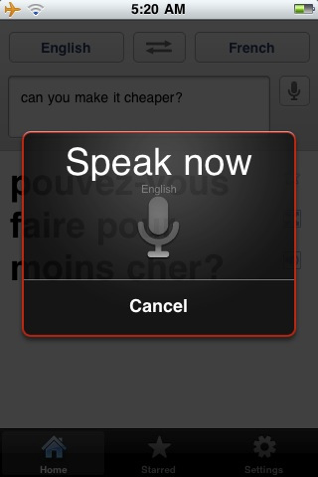 Tap the microphone icon and speak, and Google Translate processes the text and then shows what you said and that text translated into another language of your choice. (You can also type in text to be translated.) For many but not all of the languages, you can tap to hear results spoken as well. The app currently includes 58 languages in all. Like Search, Google Translate does a nice job of understanding my English speech. It even performed admirably when I was testing it in a public library and speaking softly. It didn't do as well understanding some of my test phrases in French; but to be fair, there were native speakers in France who had similar problems processing my French. Machine translations can be dicey, and the more elaborate your content the more problems you're likely to have. But for basic travel phrases I've been trying, the results seem dependable. 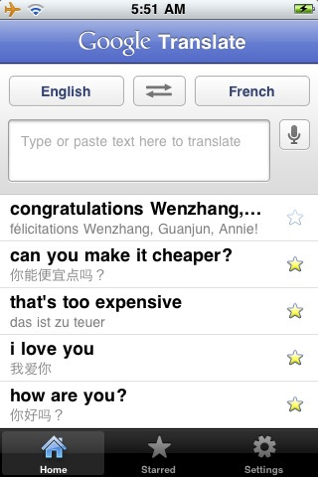 While the app requires you to be online to perform translations, results can be saved for use offline, allowing you to create your own personalized mini phrase book for use without a data connection. The app's display is optimized for the iPhone, but it doesn't really lose anything by not taking advantage of the iPad's larger screen size. If you're traveling abroad this summer to a place where the native language isn't your own, Google Translate is a worthwhile download. See the rest of the iPad Chronicles or subscribe by RSS. Sharon Machlis is online managing editor at Computerworld. Her e-mail address is smachlis@computerworld.com. You can follow her on Twitter @sharon000, on Facebook or by subscribing to her RSS feeds:articles | blogs . This story, "3 Free Voice-Recognition Apps for the iPad " was originally published by Computerworld.